ACS smart cards are available for custom branding and promotional purposes. We welcome OEM enquiries for design printing at a reasonable cost. Furthermore, customers can buy white ACS cards, which they can personalize themselves. For price details on customized printing, please contact us at [email protected]. Here are the steps for requesting customized artwork printing. 1. Choose the card you need (e.g. 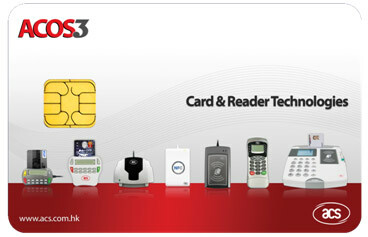 ACOS3, ACOS5, Mifare cards, SLE5542, SLE5528) or the chip you want. 3. We will check artwork and handle all revisions in this phase. 4. We will print and send you a sample card, together with a Sample Approval Form. 5. Customer signs the Sample Approval Form to accept the sample card. 6. Cards are ready for production! All images must be at least 300 dpi (dots per inch). Artwork must be at least 90 mm x 58 mm at 300 dpi (bleed area included). Remark: Finished product conforms to ISO 7810-ID1 (85.6 mm x 54 mm). We accept vector-based files created using Adobe Illustrator (.ai) and Corel Draw (.cdr) ONLY. Supply all linked graphics such as Tiff or EPS files. Please do NOT reserve the area for the contact smart card chip on your artwork; this could lead to alignment problems. Instead, simply indicate your desired module location in your printing instructions. We may fine-tune the artwork to ensure printing quality. We accept CMYK and Pantone. Please indicate Pantone IDs. RGB files will NOT be accepted. Any fonts used should be converted to curves (outlines) prior to submission. If your text is not outlined, make sure to include all fonts (including font type and size) used in the design. In case you need to print serial numbers, font type and size must be provided. No matter what the format or transfer method, artwork should never be submitted without proofs (.jpg) or (.pdf). Hard copies of properly prepared PDF files are often suitable. Did you specify your required kind of chips? Will you require printing, or just white cards? Did you provide the appropriate file format for the artwork? Is the resolution of the artwork good enough for printing? Did you provide artwork files with CMYK, Pantone colour or special colours? Does the artwork provide sufficient bleeding area around the edges? Did you convert the fonts to curves or create outlines? Did you specify your required add-ons, such as magnetic stripes, signature panels, personalization, serial numbers, and barcodes? To download a sample design, please click here.